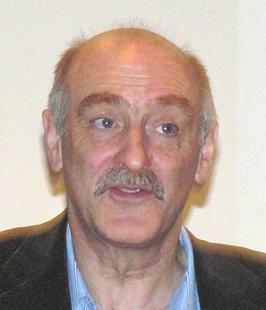 Space travel’s equivalent of the jet-stream is “ gravity assist”. A space probe can use a fly-by of a planet to speed up (or slow down) by interacting with the planet’s gravitational field. A good example is the Cassini-Huygens mission to Saturn. 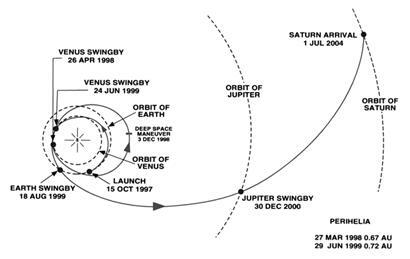 Cassini used fly-bys of Earth, Venus, and Jupiter to help it get to Saturn using much less fuel. Fred took us through a review of the spectacular Cassini mission which has produced a flood of information about Saturn and its moons including some of the most breath-taking images seen yet. (See the reports from our two Flamsteed visits by Prof Carl Murray). And what of the ‘Inter-planetary Superhighway’? Fred introduced us to Joseph Louis Lagrange, the Italian mathematician whose 1772 analysis of orbital dynamics (the 3-body problem) identified the ‘ Lagrangian Points’ — relative positions around the orbits of two bodies that are stable sites for a satellite to sit without falling towards either. 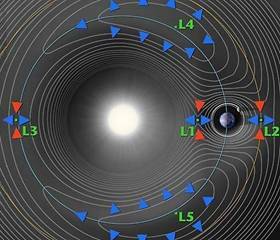 The Lagrangian Points for the Earth & Sun are used for artificial satellites (eg WMAP at L2), and points for Jupiter and the Sun accumulate asteroids — the so-called ‘ Trojans’. 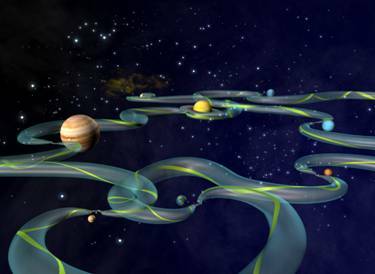 Extending Lagrange’s ideas to the whole solar system, NASA has calculated a network of routes between the planets to exploit the Lagrangian Points and produce an ‘ Inter-planetary Superhighway’ or transport network. These routes would require the least fuel to travel between the planets, but would be very slow indeed — not the choice for manned flight, but maybe ideal for robotic spacecraft.